There's a baby boom happening at a Maine hospital but it's the nurses who are expecting. Nine nurses who all work in labor and delivery are pregnant at Maine Medical Center in Portland and are due between April and July. 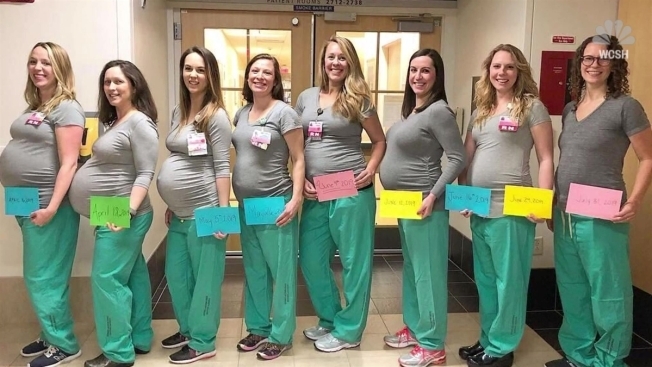 Eight of the pregnant nurses recently posed for a picture which was posted on the facility's Facebook page. They held cards to show when they were each due. Registered nurse Amanda Spear told WCSH-TV she was just as surprised as everyone else. "I feel like every other day we would come into work and it would be like, 'someone else is pregnant,'" Spear said. With 80 registered nurses currently working in the labor and delivery unit, hospital officials said they do have a plan in place for when the women take their maternity leaves. Not to be outdone, the emergency department announced that 12 nurses will become parents, too. Nurse Melanie Ann Smithgall posted a photo Wednesday showing nine of 11 pregnant nurses. Two were absent from the photo, along with an expectant father who works as a nurse. The group of 11's due dates range from April to October.